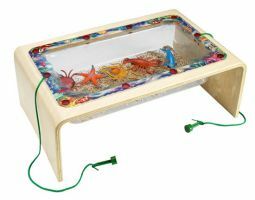 The Magnetic Sea Life Handheld is a lap table that doubles as a compelling toy that transports children to an imaginary life under the sea! Kids will be mesmerized as they use magnetic wands to move ocean friends through the sand. With life-like creatures to control, kids will happily participate in imaginative play. Such an entertaining table is not only perfect for the home, but is a useful (and fun!) distraction to use in waiting rooms. For Ages 3+. Includes lobster, starfish, dolphin, and more!